There are few disciplines in science and medicine as broadly important, or as inherently relatable, as the study of sleep. During the annual Johns Hopkins Sleep and Circadian Research Day, a disparate group of clinicians, epidemiologists, geneticists and basic researchers gather to share posters and present new findings at the vanguard of sleep research on the East Coast. Although the speakers change each year, they all tend to fit similar archetypes. Some anthropomorphize attributes of sleep in their model organism of choice, from fruit flies to mice and rats (since sleep is evolutionarily ancient and widespread), while others reexamine the medical importance of eight full hours of sleep each night, ironically speaking to an audience made up of traditionally sleep-deprived graduate students and residents. Despite my overly broad characterizations, the research presented at this sleep conference has vital implications for countless patients, and even for many of the physicians who treat them. 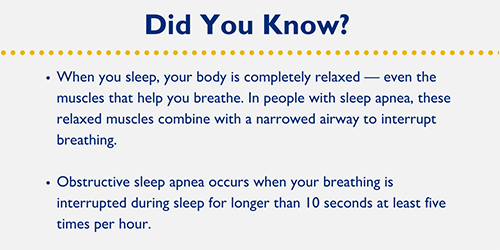 Obstructive sleep apnea (OSA) is one of America’s most prevalent disorders, diagnosed in over 12 million adults and likely present in a full 4 to 10 percent of the population. This pathology results when loss in muscle tone in the tongue or airway during sleep induces periods of shallow or paused breathing, which in turn wake the patient up for a short period of time. These brief awakenings can occur as often as 30 times an hour in the most severe cases. Little wonder that the most common symptom of OSA is excessive daytime sleepiness, along with a cluster of sleep-deprivation-related issues. While sleepiness brings patients to the doctor, physicians such as David Gozal, the keynote speaker during this year’s Sleep and Circadian Research Day, are more concerned with the physiological condition induced by OSA. As the airways close during an episode of apnea, oxygen levels in the blood plummet (called “hypoxia”), setting off numerous cellular and global signaling cascades. In a famous, multidecade longitudinal study called the Wisconsin Sleep Cohort, participants with OSA (and therefore intermittent hypoxia) were afflicted with a wide variety of adverse outcomes in addition to disrupted sleep, from increased risk of depression to cardiovascular disease. Even all-cause mortality increased in relation to OSA severity. All of these health consequences have previously been linked to poor sleep, but Gozal suggests the issue is more fundamental to this pathophysiology. For evidence, he first reexamined the Wisconsin Sleep Cohort and found that participants with OSA were also at higher risk for cancer, and were more likely to be killed by their cancer. Moving then to search for evidence in an animal model, he performed two experiments that were brilliant in their simplicity. First, he injected three groups of mice with lung epithelial cancer cells, allowing one group to breathe normal air and having one fully in limited oxygen, but keeping the others in conditions of intermittent hypoxia that model OSA. After one month, the tumors in the intermittent hypoxia mice had grown bigger and faster, and metastasized further across the animals’ bodies compared to either the mice with normal or consistently hypoxic air. This explains why OSA sufferers in the Wisconsin Sleep Cohort were at greater cancer risk. But does this phenomenon occur because the body is oxygen deprived, or because the individual cells are? Gozal addressed this cleverly as well: Before injecting his three groups of (new) mice, this time he treated the cancer cells alone, rather than the entire animal, with a normal air, hypoxic air or intermittent hypoxia schedule mimicking OSA. Following injection with the pre-treated cells, all of the mice breathed normal air, but 30 days later, those that had received the cells treated with intermittent hypoxia grew bigger, more aggressive tumors. Regardless of how elegantly Gozal’s experiments address his scientific queries, it sometimes seems unfair that those sufferers of OSA already burdened by increased disease risk across the board are now forced to add cancer to the list. Fortunately, for most OSA patients, a treatment that is already available and has proved to be quite effective is the use of a continuous positive airway pressure (CPAP) machine. This machine uses a small fan to pressurize air and deliver it to the patient via a facial mask throughout the night, keeping the airway inflated during sleep. Users often report feeling better and more refreshed almost immediately, and numerous studies have confirmed the machine’s efficacy in terms of restoring sleep and lowering blood pressure, among other benefits. Nonetheless, adherence to using the CPAP machine consistently hovers around 30 percent, even among those who sing its praises in surveys. For this reason, the Johns Hopkins Sleep and Circadian Research Day is an important reminder of just how vital sleep is to our health and well-being. As researchers and doctors continue to parse its complex role in our lives, better understanding and better treatment options will continue to bring that CPAP adherence number up, and the incidence of apnea and its cancer risk down. Who Has Time to Sleep?